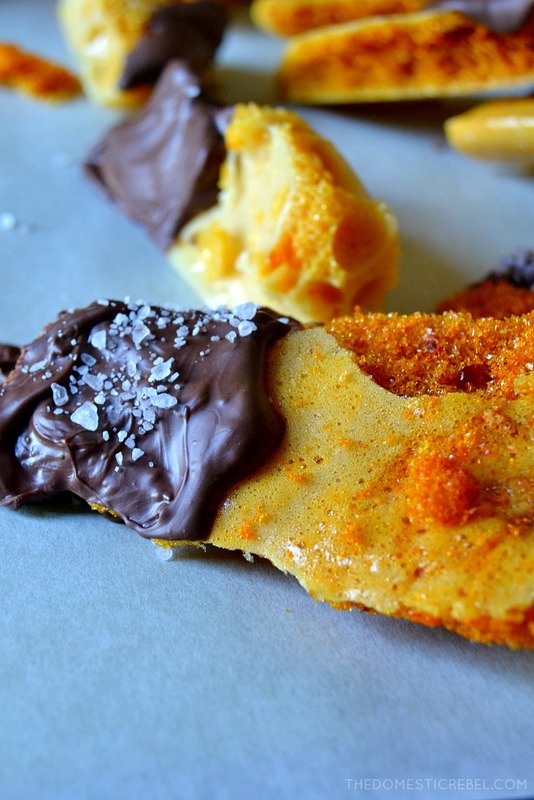 Old-Fashioned Honeycomb Sponge Candy is a popular vintage treat! A fun take between toffee, brittle, and caramel, it’s crunchy yet light and flavored with real honey. Dip it in chocolate for a festive twist! Welcome to Homemade Candy Week Day 3! Today we’re talking all about a vintage recipe that needs to be brought back ASAP! So as you may or may not know, I’m a vintagephile. It sounds bad but I promise it just means I am obsessed with all things retro, kitschy, and vintage, especially from the 1950’s. I dress like a 50’s girl, my home is decorated like a 50’s home (or at least, it’s coming along! ), and I love reading about vintage recipes. Some vintage recipes – like those blasphemous gelatin molds filled with like, cubed ham and crap – should stay in the 50’s, but there are other things that deserve a new light! To be honest, I didn’t know much about Honeycomb Candy until I started researching vintage recipes. I wouldn’t say it’s totally *vintage* per se; but definitely old-fashioned. In fact, I don’t know many places that carry it regularly. Maybe a really authentic candy shop? Who knows! But it was high time I investigated whether or not this candy should stay in the past or get a facelift for present day. Honeycomb candy goes by many different names: sponge candy, seafoam candy, sponge toffee, and hokey pokey to name a few. It’s such a unique candy because of its texture and flavor, as honey is usually not a forefront candy flavor. 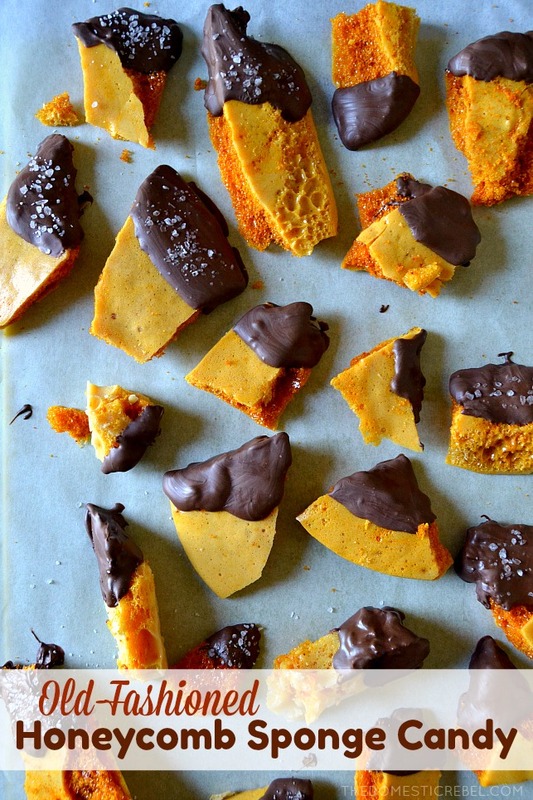 It’s a fun cross between toffee and brittle with a light, airy, honeycomb texture that’s crispy, too. 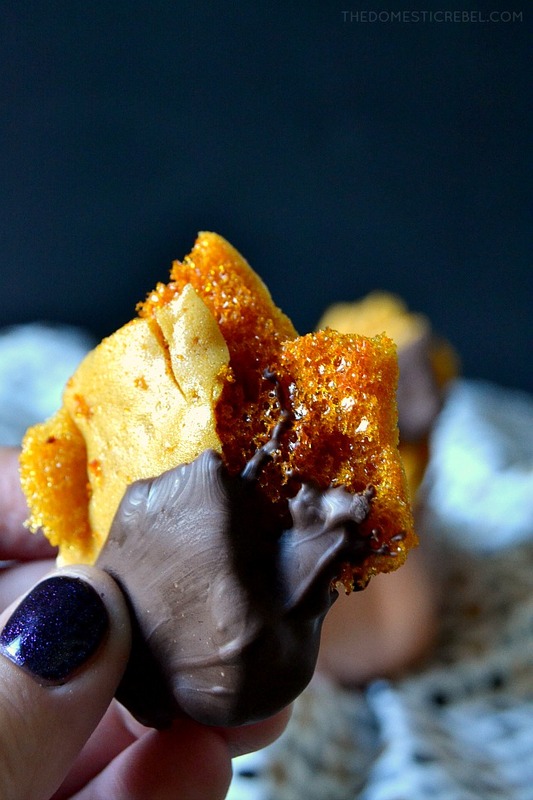 Some people prefer plain ol’ honeycomb, but I think it’s extra elegant, flavorful and pretty dipped in dark chocolate and sprinkled with flaky sea salt. 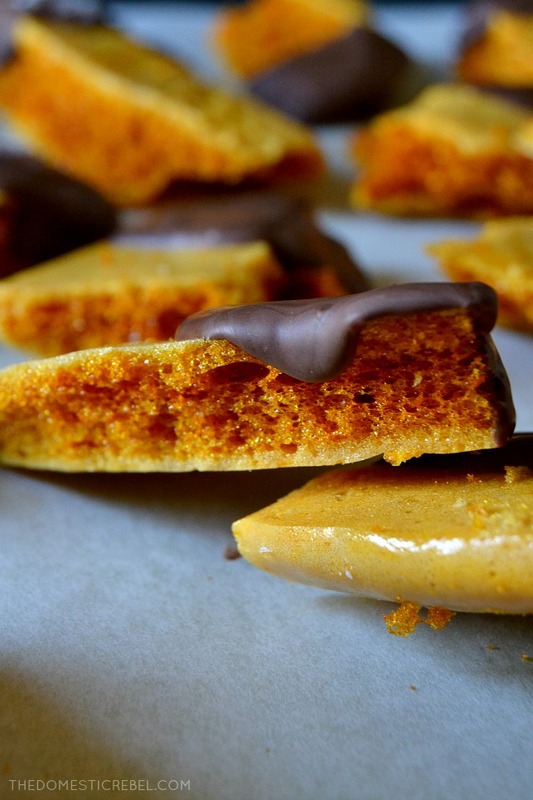 There are a few key steps to making honeycomb candy, so be sure to read through before starting! Make sure you have your ingredients laid out and ready to rock & roll. The process moves relatively quickly, and you don’t want to be scatter-brained and measuring things at the last second since you’re working with molten sugar/caramel which can burn fast. You’ll also need a candy thermometer to prepare this recipe, but thankfully those are quite inexpensive and at most grocery stores! You can use any kind of honey, but I prefer filtered over raw for a better consistency. My instructions will call for a big pot – I like using a 5qt Dutch oven or spaghetti pot. It will seem comically too-large once you first add the ingredients, but soon you’ll realize this mixture bubbles up a LOT once the baking soda’s been added as a final step. This is just a safety measure more than anything! This candy HAS to be placed in an airtight container at all times. Believe me, my mistake was leaving it uncovered at room temperature all night and by the morning, it was just kinda soggy and melty. It’s more delicate than say, English toffee, and thus needs to be in a controlled environment (ha!). It can stay room temp, but make sure it’s airtight. Because this candy is brittle and fragile, I recommend breaking it into chunks with your hands rather than cutting it. Cutting with a knife will cause it to crumble since the honeycomb/airy texture is so light and delicate. As you break it into shards, you’ll notice there will be quite a bit of crumbled bits – try topping a cake or ice cream sundae with it, or blend it into a milkshake. Don’t let those pesky little crumbs go to waste! When you pour the molten honeycomb mixture into the prepared pan, resist the urge to smooth out the mixture! Seriously, do NOT do this! You’ll wind up breaking up that honeycomb signature texture. Just leave it uneven as is. 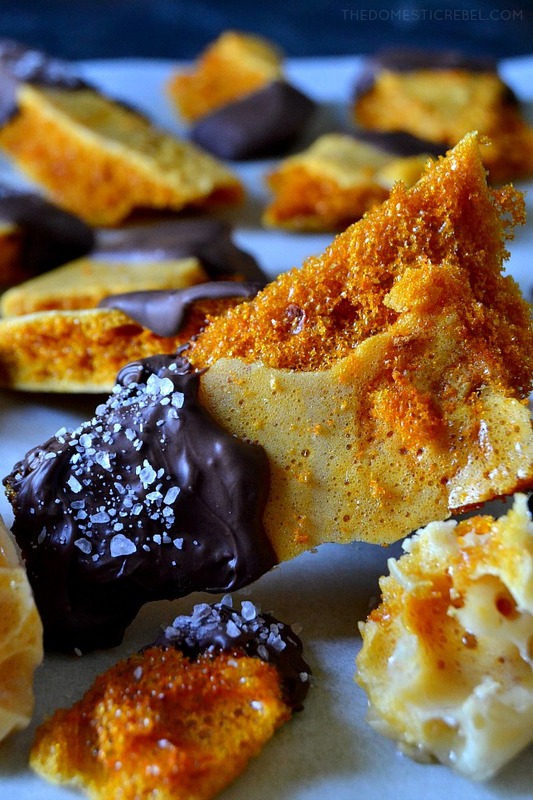 Crispy, airy, light and flavorful honey-caramel toffee coated in dark chocolate and sprinkled with sea salt. Heavenly honeycomb! 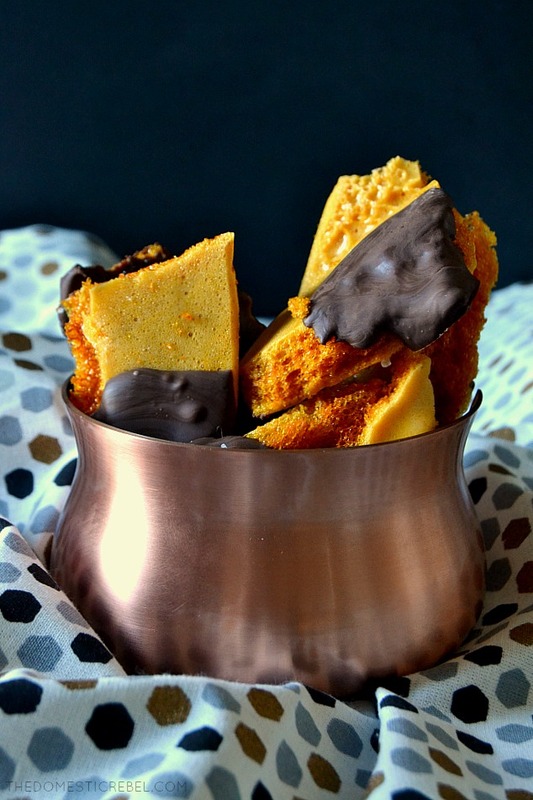 This Old-Fashioned Honeycomb Sponge Candy is light and crispy toffee flavored with real honey in a unique, brittle-like candy! Line a rimmed baking sheet, such as a 10x15 jelly roll pan, with parchment paper. Have it handy! In a large 5-qt Dutch oven or spaghetti pot, combine the granulated sugar, honey, and pinch of salt. Heat mixture over medium heat, stirring until blended and sugar has dissolved some to ensure even caramelization. Cook to 295 degrees F, about 5-7 minutes depending on your stove. The mixture will turn a pretty amber color. Remove from the heat and immediately add in the vanilla extract and baking soda, whisking the mixture vigorously. Mixture will bubble and foam up, so be careful! Working very quickly, pour the honeycomb mixture evenly onto the prepared pan. Do NOT smooth it out; it will be uneven but you don't want to break up that texture by messing with it. Let the mixture cool completely, about 5-10 minutes, before snapping into pieces. Dip each chunk part way into dark chocolate, and sprinkle with flaky sea salt. Store any leftovers air-tight at room temperature. Buttery, golden honey-flavored toffee with a smattering of flaky sea salt and rich dark chocolate. So yummy! I’ve made this many times but never with the chocolate topping. It melts in your mouth and I find it hard to not eat it. Keeping it securely dry in a container is very important! Great recipe. Hi Hedy! The chocolate adds a nice touch, as does the sea salt… but you can always omit both if you’re a purist! Dang! Between these photos and the last shots of your vanilla-speckled homemade marshmallows, I am mesmerized by the texture, the sparkle, and the swirl that you capture in your photos. God, I wish I could taste these through the screen. You really captured something amazing here, Hayley. Yum, yum, yum, yum. yum…. Hi Kim, I have not tried the maple syrup swap but it is possible it could work! Obviously it would no longer have that honey flavor.